The circle of Willis is a polygon-shaped arterial anastomosis in the brain formed by internal carotid and vertebral artery systems around the optic chiasm and infundibulum of the pituitary stalk in the suprasellar cistern. The circle of Willis provides important communications between the blood supply of the forebrain and hindbrain and allows equalization of blood-flow between the two sides of the brain in addition to providing anastomotic circulation when a part of the circulation gets occluded. Anatomical variations of the circle of Willis are very common and a well-developed communication between each of its parts is identified only in less than half of the population. The entity was first described in 1664 by Thomas Willis, an English physician. The left and right internal carotid arteries arise from the left and right common carotid arteries. Right and left internal carotid artery enter the skull each one divides into two main branches: the anterior cerebral artery (ACA) and middle cerebral artery. The anterior cerebral artery forms the anterolateral portion of the circle of Willis, while the middle cerebral artery does not contribute to the circle and is not part of the circle of Willis. The anterior communicating artery connects the two anterior cerebral arteries and could be said to arise from either the left or right side. Anterior communicating artery allows cross flow between the two. 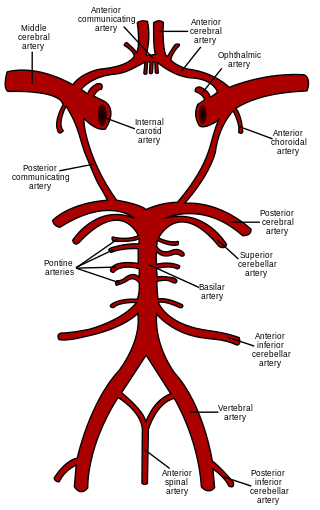 The A1 segment of the anterior cerebral artery is a participant in the circle of Willis. A1 segment extends from bifurcation of the internal carotid artery in a medial and superior direction to the anterior cerebral artery’s junction with the anterior communicating artery within the inter-hemispheric fissure. Before giving its terminal branches – the anterior and middle cerebral arteries, internal carotid artery gives a branch at the anterior perforated substance – posterior communicating artery which travels posteriorly through the interpeduncular cistern to connect to posterior cerebral artery, branch of the basilar artery. There are two posterior communicating arteries anastomosing with two posterior cerebral arteries. The basilar artery divides at the upper border of the pons to form the left and right PCAs. The vertebral arteries arise from the subclavian arteries. The anterior communicating artery is a large and a single internal carotid supplies both anterior cerebral arteries. Narrow proximal part of the posterior cerebral artery with large ipsilateral posterior communicating artery is large, so the internal carotid artery supplies the posterior cerebrum. cerebral. Fenestration of the basilar artery is found in less than 1% of cases. Supply the anterior hypothalamus, anterior commissure, fornix, striatum, optic chiasm, and optic nerves. Perforators that supply the hypothalamus, optic chiasm, corpus callosum, and fornix. Direct perforators dor thalamus and internal capsule. Short and long circumflex arteries supply the thalamus and midbrain. Anterior thalamoperforators to supply brainstem. The direct perforators supply the thalamus, brainstem, and internal capsule. Subclavian steal syndrome results from a proximal stenosis (narrowing) of the subclavian artery. Vertebral artery is a branch of the subclavian artery and the subclavian artery is responsible for the circulation o upper limb. When the subclavian proximal part is narrow, the blood via the circle of Willis travel by the vertebral artery to the distal part of subclavian and thus going to the limb. This may result in insufficiency of brain circulation and symptoms like syncope, neurologic deficits, memory issues may occur. Even the limb circulation may not be well compensated. Asymmetry of the circle of Willis results in significant asymmetry of flow and is one important factor in the development of intracranial aneurysms and ischemic stroke.